This is a signal mirror made by Sun Company. It has some interesting details compared to other popular signal mirrors. The first difference is that this mirror is bigger, at 4.2 inches by 3.1 inches it is not suitable for a wallet and barely ok for a pocket. It is also very thin and extremely light only 1/3 of an ounce. There is a small hole in the center used to aim when signaling (not seen in the picture), the reflective material is plastic and is not really very good reflecting light that is why the mirror is probably so big. In our tests this mirror had problems aiming and the reflected light was not very bright compared to other signal mirrors. In our opinion this mirror makes sense as a backup or if you manage to cut it down for wallet size as something that you can carry in your wallet without adding weight and will only be used in case of need. As a test we cut this mirror to credit-card size with a simple pair of scissors, cutting it was not difficult at all and the mirror survived the operation without problems. 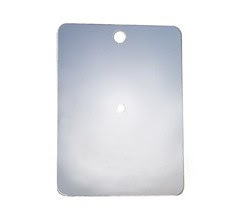 Carrying the trimmed mirror in a wallet is fine as a backup signal mirror or as an utility mirror. To check your face, apply makeup or similar tasks it works fine. Just don't put your chances of being rescued in the hands of this mirror because there are better ones. 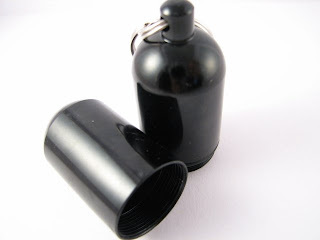 This is the X-large version of the popular spy capsules frequently used to carry pills and other small items. This capsule is about 2 inches long and 1.5 inches in diameter, it is opened at the middle and it has an o-ring to make it water resistant. At the top there is a hole with a split ring. The capsule is large enough to carry AA, AAA or C123 batteries, and it can also be used to store money, mini survival kits and other items. We didn't like the way the capsule opens in two halfs, the space inside would be more usable if the threads were located at the top as in other capsules. When you open it contents will come out unless they are very tight. The construction in anodized aluminium is very solid and there are several colors available: red, green, blue, black, purpke and gold. The size is probably too big for a keychain but can be used hanging from a backpack or inside a survival bag or kit. You can order from EDC depot at $7.